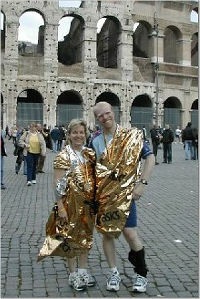 Rome Marathon 2005. Rebels in Italy. Lori and I set out to have a fun, sightseeing marathon and come in around 4 hours (which we basically did running 3:53 and 4:01, respectively). We ran by all the usual suspects, starting with our backs to the Colosseum, running by Circus Maximus three times (where thankfully nobody tied a chariot to me! ), Piazza Novona, along the walls of Vatican City and even running towards the Basilica into St. Peter's square. There was always something to see along the way. While in the city proper, cobblestones were the only terrain, definitely making up more than a third of the course. But they were well worn, so not as bad as we feared. No mile markers, but we were savvy enough to figure out how we were doing kilometer by kilometer, especially after being in the back of the pack since the race actually started early!! Lori took pictures along the route and we often had this conversation--"Hey, take a picture of that! "; "What is it? ", she replied; "I don't know but it looks cool (old)". Support was great with water and Gatorade every 5K and we saw Sharon, John and Kyle a couple times. It was about 30K the last time we saw them in Piazza de Popolo (another piazza!) and after that Lori's three marathons in 4 months began to make themselves known. After taking pictures at the Spanish Steps and Trevi fountain, we started to separate and I picked up the pace some to pass the 4 hour balloons. My last 5K was about 22 minutes and I ended up finishing about 8 minutes before Lori did. She crossed the line just as happy as when she started, we got our medals (the best medal either of us had ever received by far) and made togas out of our foil wraps! Then we had to rendezvous with our intrepid supporters back near the Colosseum, what better way then to walk through the Roman Forum. That's where the real cobblestones were and we definitely got some interesting looks. And the rest is, well...history.